Just stopping in to say hello. It's been a very busy start to the New Year, a great thing, but I still keep you all in my mind as I work. Here's a little visual eye candy via the very talented Jim Denevan. I came upon his work a while ago and couldn't keep my eyes off of the beautiful, earthy designs he creates with his bare hands (well, and sometimes some help from his pick-up). 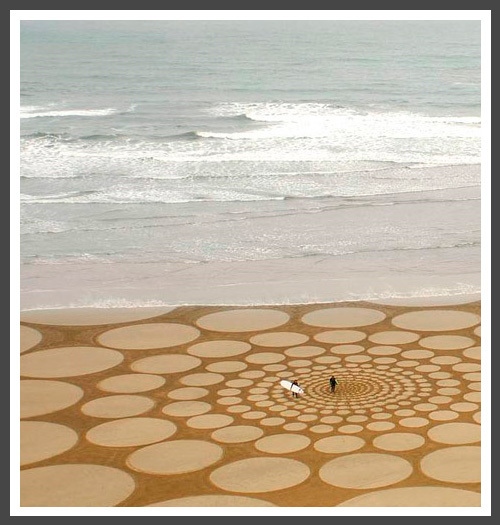 Check out his site for some more images of this fabulous, large-scale work. Hi Lizzy, I love your work and you are very talented. Would like to see more invitation designs and on what inspires you.